Never Send a Man to Do a Detective’s Job Collected for the first time in a complete, ebook-only bundle, experience hijinks, danger, and romance in fan-favorite author Rachel McMillan’s The Herringford and Watts Mysteries 6-in-1! Follow best friends and sleuths Merinda Herringford and Jem Watts as they cast off Edwardian conventions and launch a consulting detective business in tumultuous early 20th century Toronto. 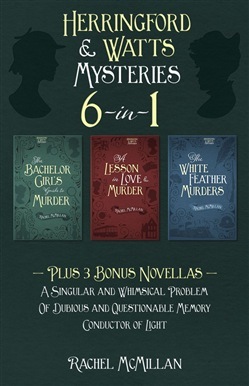 This captivating compilation includes the three original full-length novels interspersed with three bonus novellas: A Singular and Whimsical Problem A Bachelor’s Guide to Murder Of Dubious and Questionable Memory A Lesson in Love and Murder Conductor of Light The White Feather Murders Determined, adventurous, and full of moxie, Merinda and Jem, together with their friends Constable Jasper Forth and reporter Ray DeLuca, tackle dramatic mysteries and political corruption as they become emblems of female empowerment. Join the adventure as these two independent women search for answers, don disguises, and find themselves where no “proper” ladies would ever go. 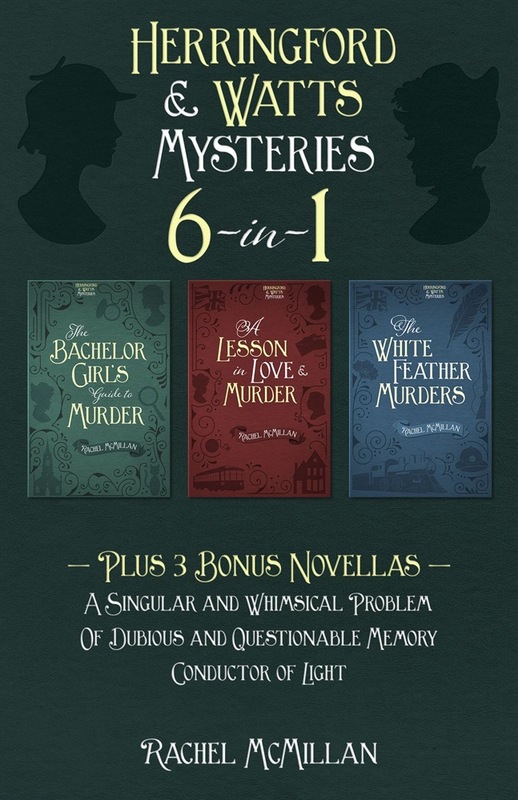 Acquista The Herringford and Watts Mysteries 6-in-1 in Epub: dopo aver letto l’ebook The Herringford and Watts Mysteries 6-in-1 di Rachel McMillan ti invitiamo a lasciarci una Recensione qui sotto: sarà utile agli utenti che non abbiano ancora letto questo libro e che vogliano avere delle opinioni altrui. L’opinione su di un libro è molto soggettiva e per questo leggere eventuali recensioni negative non ci dovrà frenare dall’acquisto, anzi dovrà spingerci ad acquistare il libro in fretta per poter dire la nostra ed eventualmente smentire quanto commentato da altri, contribuendo ad arricchire più possibile i commenti e dare sempre più spunti di confronto al pubblico online.